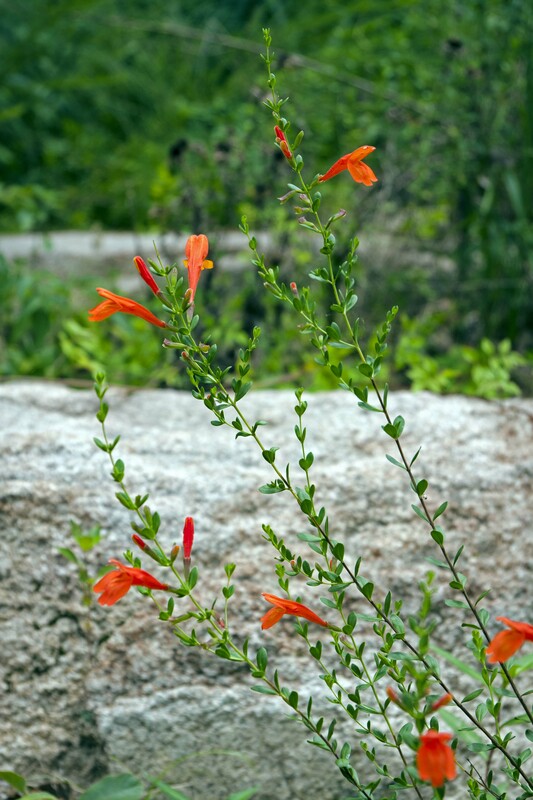 The tubular flowers are a bright orange-red. I’ve been coveting Scarlet Wild Basil (Clinopodium coccineum) for years. It is one of the summer-blooming stars of the Sandhills Native Habitat Garden at the NC Botanical Garden in Chapel HIll. I’m not the only one who admires it. The Greenhouse and Nursery Manager at the NCBG tells me that it is one of the most frequently requested plants by folks visiting the Plant Sale area of the Garden. He can’t keep it in stock. This native of the Sandhill regions of Georgia, Florida, Alabama, and Mississippi has many common names besides Scarlet Wild Basil, including Scarlet Calamint, Red Savory, Red Mint Shrub, Scarlet Balm, and Red Basil. The evergreen, opposite-leaved foliage is mildly aromatic, which probably explains most of its names. In my garden, it has, so far, proved to be uninteresting to deer or other varmints, probably due to its spicy-smelling foliage. I was able to acquire a tiny plant from the NCBG last fall. It was too small for sale in the Plant Sale area yet, but I persuaded the Nursery Manager that I could coax the little specimen through the winter. I am delighted to say I succeeded. Here in NC, we are technically outside the native range of Scarlet Wild Basil. One of our rare, very cold winters might well kill it. Likewise, because it is native to sandy soils, too much rain can also destroy it. Luckily for me, I have a spot in my yard that is, more or less, a natural rock garden. Massive boulders adorn a spot beside my garage, probably resulting from when the original owner of my home put in the driveway. These boulders have begun to break down a bit, and the soil around them is a shallow mix of sand and bits of rock — ideal for plants that need sharp drainage and can benefit from the extra warmth of heat-absorbing boulders. Even so, I built up the sand into a little hill before I planted my tiny Scarlet Wild Basil last October. Then I surrounded the plant with small rocks, to add heat, and to prevent heavy rains from eroding the sand away from the base of the plant. Our winter was dry, so about every three weeks if it hadn’t rained, I watered the newcomer thoroughly. My attentiveness paid off. It began blooming a bit in April, and it’s been blooming off and on ever since. The excessive rains of June here slowed flower production, but now the plant seems to be trying to make up for lost time. It is a bloom-producing machine! And the hummingbirds are delighted by this addition to my landscape. Further south, it has been observed blooming every month of the year. In its native range, this plant can grow to between 1-3 feet tall and wide. Mine will probably remain on the smaller side of that range, because I’m pushing its tolerance for cold a bit. Right now, it’s about 1.5 feet tall and spreads about 2 feet across. Even though it’s petite, you can’t miss those orange-red tubular blossoms, especially with the boulders behind it as background. I continue to be delighted by this recent addition to my landscape — and the hummingbirds agree! The boulders around it provide extra warmth in winter and serve as a neutral backdrop that highlights the flowers. This entry was posted on July 29, 2013, 9:16 am and is filed under Favorite Plants, Native Wildlife, piedmont gardening. You can follow any responses to this entry through RSS 2.0. You can skip to the end and leave a response. Pinging is currently not allowed. It is a lovely little plant, isn’t it? Thanks for stopping by! 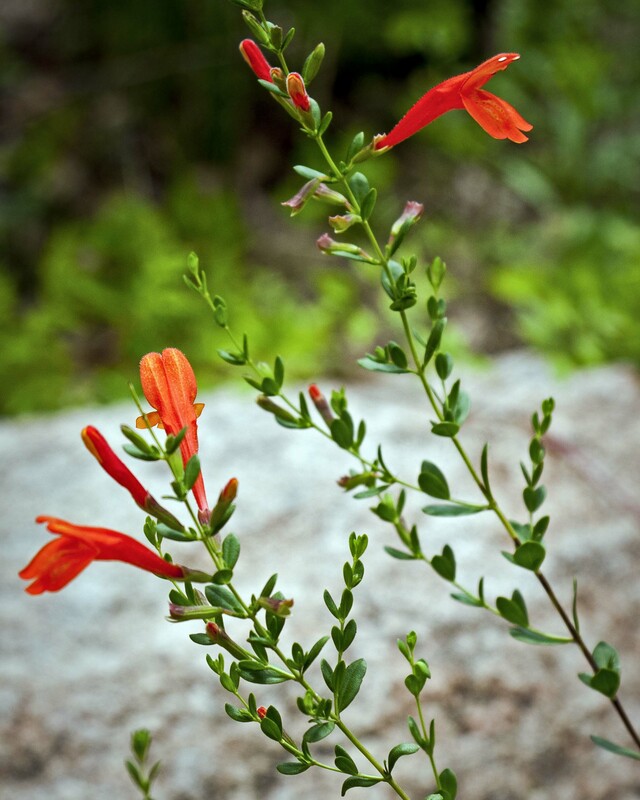 I found some growing in the wild and dug them out and planted them in my yard.The soil conditions in my yard are identical to the wild.The plants are thriving with plenty of flowers.I live on the Florida Panhandle white sandy soil these plants like. I’m glad the Scarlet Wild Basil you dug up is thriving in your yard. However, I hope you asked permission from the landowner before you dug up the plant. Our native wildflowers are having a tough time surviving in the wild these days, and when folks dig up naturally occurring plants, others of the same species don’t always pop up to replace what’s been taken. The good news about Scarlet Wild Basil is that you can find it legally for sale through nurseries that specialize in native wildflowers. I encourage you to pursue that option the next time you spot a wildflower you’d like to add to your yard. I have searched all day for the name of this plant. Thank you. So lovely, we found a large patch growing on the side of the road. Lower Alabama near the pitcher plant bog, Weeks Bay. Thanks for the cultivation tips for growing Clinopodium coccineum. I ordered some to trial in my Colorado rock garden and which hopefully will arrive next month. I plan to eventually plant them out on a steep, sunny east-facing hillside of dry sandy loam, cobbles and granite boulders where Asclepias tuberosa thrive. Your article offers the most informative details on growing conditions that I have been able to find. Thank you.